Rio Ferguson, 10, shoots a Smith and Wesson 626 .22-caliber revolver at a target at Marlborough Fish and Gun Club. 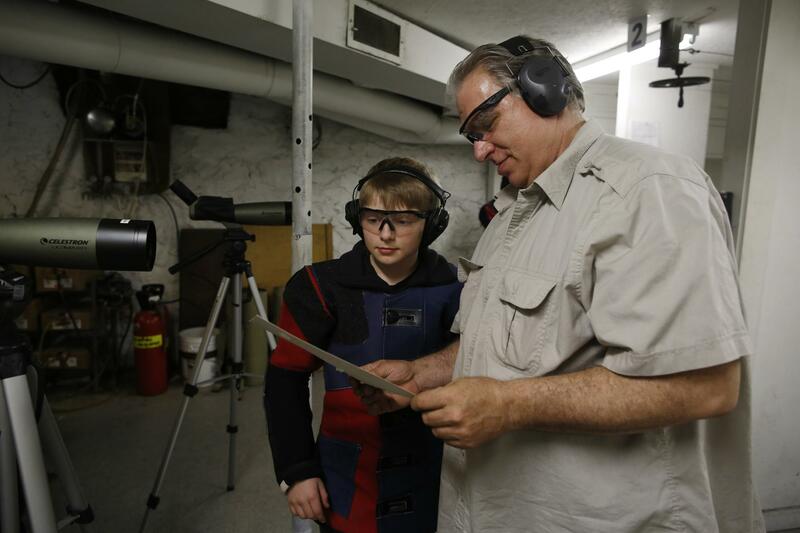 While adults take sides on the propriety and safety of firearms, competitive marksmanship is a growing draw for children and teens who find satisfaction in the discipline a bull’s-eye requires. Northborough, Massachusetts — The present resting under the Christmas tree for 10-year-old Rio Ferguson last year was a mystery. Carefully wrapped in cream-colored paper adorned with black-and-gold game animals, the rectangular box could have contained any number of toys or games. It wasn’t until the boy ripped the package open on Christmas morning that he learned his parents had bought him an AR-15, a semiautomatic rifle, rather than the AK-47 that he is also fond of. He was thrilled. “It’s got really cool sights,” Rio exclaimed recently. It was not Rio’s first gun. He got that months earlier, on his 10th birthday: a trim, black M&P 15-22 rifle. Then, in April, his parents gave him a third gun for his 11th birthday, a 20-gauge shotgun. He now has a gun fund and has earned $170 doing extra chores. Although there are certain things his mother will not let him buy with his money — rap with violent lyrics or certain videos, for example — guns are not on the list. “If guns are his passion, that is fine with me,” his mother, Diane Houston, says. Rio inherited his love of firearms from his parents, both of whom were raised in Wyoming in families for whom guns and hunting were a big part of life. They have versed their son in firearm safety since he first fashioned a toy gun out of PVC pipe as a toddler. 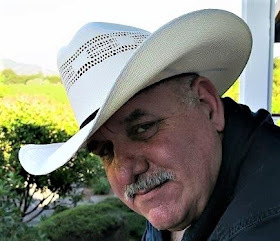 Recently, he participated in a local junior target shooting program, one of several “shooting sports” that has become increasingly popular among young people. At a time when America’s debate about gun control is at a fever pitch, young people are learning to use firearms in ever greater numbers. 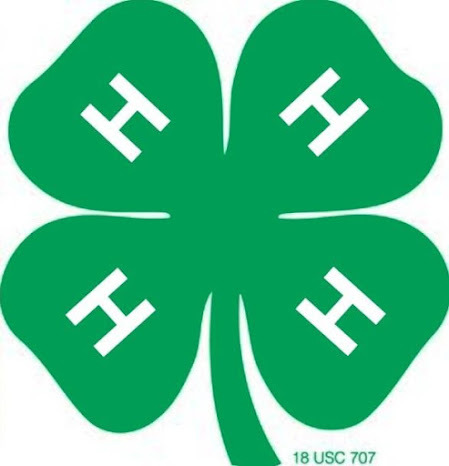 Participation in the nationwide 4-H Shooting Sports Program, which includes archery, hunting, pistol, rifle, and other firearms, has nearly tripled since 2009 and last year drew 336,558 program participants nationally. The actual number of youths involved is doubtless somewhat different than that, as some sign up for more than one offering and not all states report, but the trend is clear. 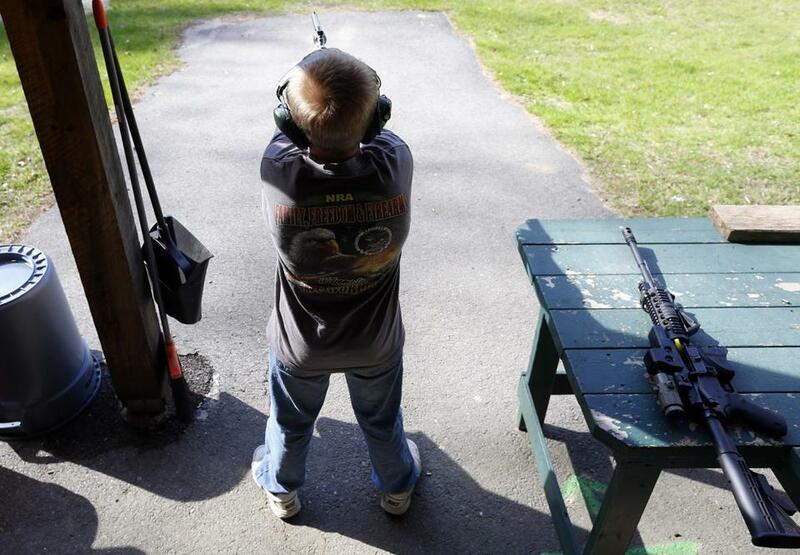 Throughout the region, junior shooting programs with names such as “The Projectiles” and “The Hot Shots” are generally open to children age 10 and up. The ranges are packed with boys and, increasingly, girls. 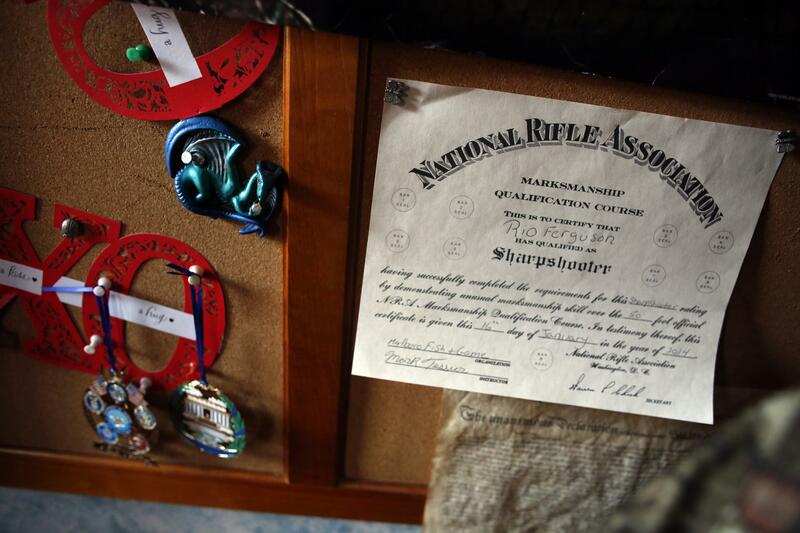 An NRA Marksman Qualification Course certificate hangs on the bulletin board in Rio Ferguson’s bedroom. Many parents of young shooters like it, too. Not only do the demands of target practice improve their children’s focus, they say, but the programs demand a high level of personal responsibility. There are no-exceptions safety rules on the range. And youths are routinely asked at some clubs to bring in their report cards — good grades can be a condition of participation. As with many things that have to do with guns, the topic engenders passionate feelings on both sides. Critics argue that children should not be using firearms in any situation: As with alcohol or motor vehicles, they say their use should be limited to those of mature age. “The fact is, children don’t have the developmental skills to hold highly developed military weapons,” says Josh Sugarmann, executive director of the Violence Policy Center in Washington. 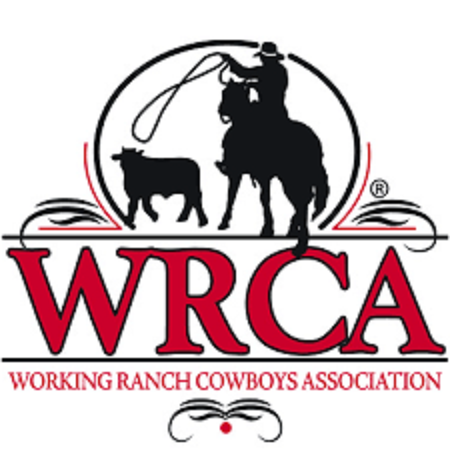 But promoters maintain that junior shooting teaches the same life skills instilled by other sports, particularly self-discipline and the pursuit of excellence. Teaching children how to use guns, they add, will reduce the likelihood of accidents. Young people who shoot, some of whom nurse Olympic dreams, know this debate all too well; more than a few of them have already experienced some backlash firsthand. When a news account of a Fairhaven teenager who is a nationally ranked competitor was posted on a bulletin board in her school, her family says an administrator cut out the photo of her holding her rifle. A high school senior in Foxborough was prohibited by school authorities from using a photo of himself shooting a .22-caliber rifle in a competition on his yearbook page, his father says. Even Riois wary of talking much about his favorite pastime. His father recently told the mother of one of his close friends that they had guns in their house, all of them locked up. The friend has never come to visit. Asked how many of his other friends he has told, Rio raised his thumb and forefinger and made the shape of a zero. “I just don’t talk about it,” he says with a shrug. “Kids might tell their parents. Or they might decide they don’t want to be my friend.” Shooting early and often. 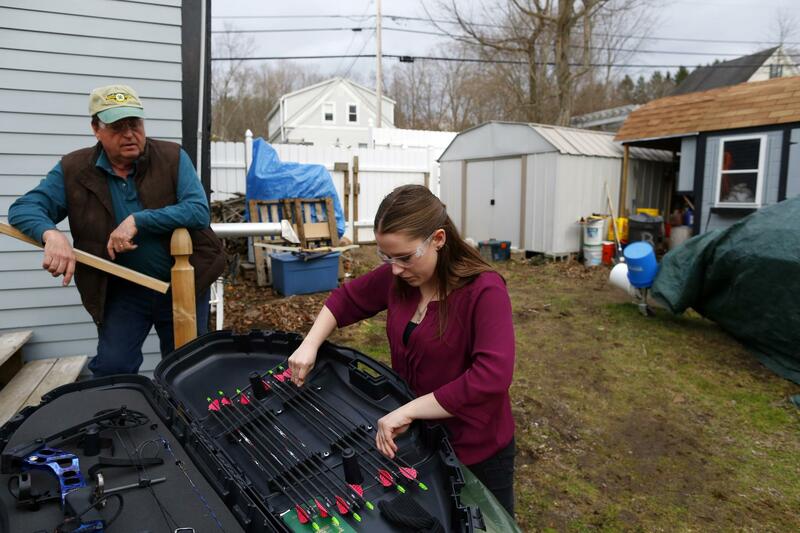 Mike King chatted with his daughter Morgan as she put her arrows away after shooting in their backyard in Epping, N.H. It is a bitter cold morning at the Chester Rod & Gun Club in New Hampshire, and a dozen teenagers are sitting around a table learning the parts of a .22 rifle as the adjacent indoor range crackles with gunfire. 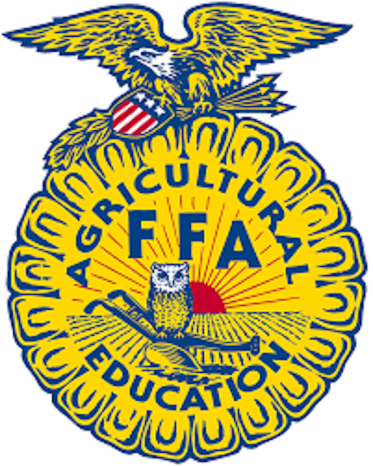 While half the youths have shot before, they are all required to attend a safety program before participating in the 4-H Junior Rifle and Archery League. But both they and the adults in charge want to get on with it. And come back they do. Youths have been flocking to the small gray club building in such numbers in recent years that program coordinator Mike King has stopped advertising. This year, about 60 youths, ranging in age from 10 to 18, attended, one of the largest groups ever. In the past, children ages 8 or 9 and even younger were allowed to take part if they were judged sufficiently mature, but with so many youths now attending, King says he can no longer take such young ones. Some shooting coaches attribute the recent surge in participation in youth shooting and archery in part to the immense popularity of “The Hunger Games,” a book series published beginning in 2008 and the subsequent film adaptations. King, 65, a Vietnam veteran and an amiable HVAC repairman from Epping, N.H., also sees it as a form of anti-Obama backlash, a kind of rallying around the Second Amendment. But lately, he has come to see it as something that is more driven by the young people themselves. Under the gaze of trained instructors, the youths at the Chester gun club shoot .22 bolt action rifles at paper targets from sitting or standing positions. After four sessions and some instructional videos, they can graduate to a lever or pump action gun. Those 12 and older who have demonstrated they can handle a rifle can also move to pistol shooting as long as they are accompanied by a coach. Although boys are in the majority in many shooting programs, girls are widely considered the better students, many coaches say. For 10-year-old Noelle, a fifth-grader with shoulder-length blond hair, the repetitive motion of shooting and reloading her gun is “very calming,” she says. Noelle, whose parents — wary of public reaction — asked that they be identified only by their middle names, joined the Chester program when she was eight years old, following in the footsteps of her older brother and sister. On a recent morning, she pulled on a set of ear protectors, aimed her grandfather’s Winchester 52E International Match rifle at the target 50 feet away, and pulled the trigger. Her goal was to get three shots in each of five targets the size of a quarter. She came close. Neither of her parents is big on the sport: Her father occasionally shoots trap to keep his son company. Joanne and her husband discouraged their son from playing with guns, but somehow the toys showed up in their house, and he took to them with a passion. When Joseph was 14 years old, Joanne’s father packed up his Winchester and sent it to his grandson as a gift. Joanne somewhat reluctantly began to explore training options for him. Noelle has many other interests. She plays the flute and drums, performs in her school’s dramatic productions, and excels in math. Noelle’s parents clearly agree, but they have cautioned their children not to discuss their pastime with others. Manufacturers, on the other hand, appear to have found in children such as Rio and Noelle an expanded market for their advertising. Although firearms small in size and caliber have long been around, manufacturers have lately introduced models with vivid colors and catchy names specifically designed to appeal to youths. This year, Henry Repeating Arms introduced the “Muddy Girl,” a lightweight “beginner’s .22” sporting a vivid pink, purple, and black pattern for girls ages 7 to 10, a female version of their stock minibolt rifle. Rio Ferguson, (left), and his father, Jay (right), both enjoy guns. “I just like to shoot,” Rio says. “I just like holding that beautiful creation in my hands.” Rio also plays tennis, practices his yo-yo, and fishes. Manufacturers have found a welcoming forum in a magazine designed for young shooters called Junior Shooters, which launched in 2007. 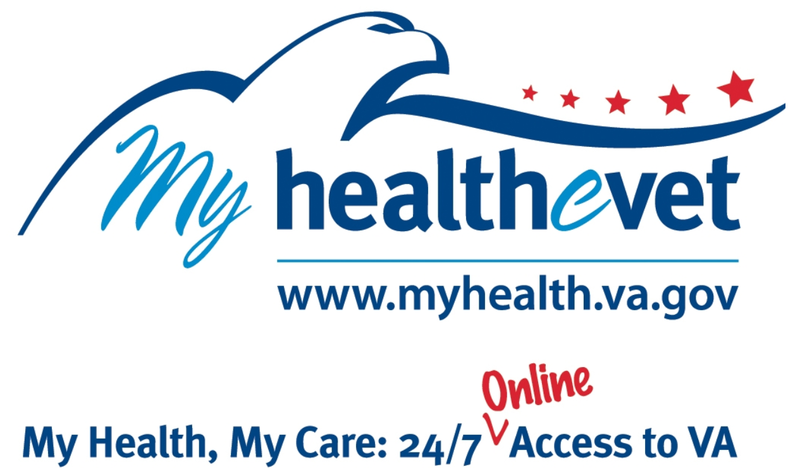 Free of charge, its online version bristles with advertisements for guns and ammunition. Not that many of the magazine’s young readers can buy them. Under federal law, licensed dealers are prohibited from selling handguns to anyone under 21 and long guns to anyone under 18. Federal law does not establish a minimum age for possession of long guns, although several states and a few local governments have established their own age requirements. In Massachusetts, no one under 18 can purchase a rifle or shotgun and no one under 21 can purchase a handgun. Youths between ages 15 and 18, however, can apply for a Firearms Identification Card, or FID, with the permission of a parent or a guardian, which enables them to possess a rifle or shotgun. The marketing of child-friendly guns in playful colors troubles some activists on both sides of the gun control issue. Jay Ferguson, Rio’s father, also objects to childish marketing strategies. "I think guns are fairly serious business," says Ferguson, who works in computer software research and development and is an NRA-certified instructor. "When you make guns to appeal to a kid’s sense of toy-ness, you are blurring the lines." Seasoned shooters, the Fergusons have 11 guns in their house stored in four safes; they include a couple of rifles, several shotguns, Rio’s AR-15, and five pistols. In addition to shooting, Rio plays tennis, practices his yo-yo, and fishes. But of all his activities, target shooting is the one that his mother feels has been most effective in imparting valuable skills, which she describes as “situational awareness” and patience. It is a skill that Rio holds dear. When asked on a recent homework assignment to write about something he believed in strongly, Rio chose the Second Amendment. Like Rio, many youths who shoot are accustomed to having guns around their home. When Tyler Lefebvre and his brothers sit down to breakfast in the morning, for example, they’re careful not to push their chairs too far back. If they do, they might knock over the blue and silver air rifle poised next to the kitchen table and aimed, unloaded, into the living room. 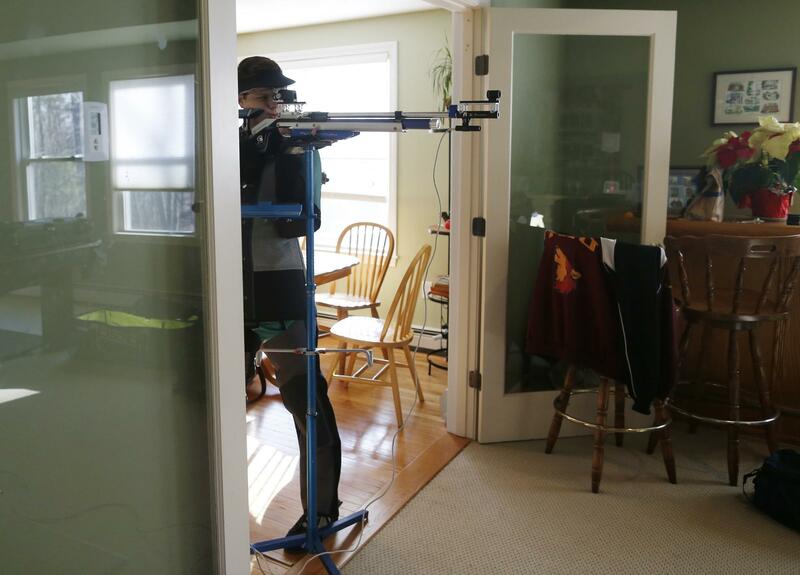 Tyler Lefebvre, 17, a member of the Taunton Marksmanship Unit, practiced shooting with an air rifle in the living room of his home in Uxbridge, Mass. Tyler, 17, is a skilled target shooter. A member of the Taunton Marksmanship Unit, one of a handful of advanced level junior shooting programs in the state, he was recently ranked 145th among junior men in air rifle, according to USA Shooting, which promotes shooting sports in the US. He practices five days a week, at least one of them on the air rifle in the kitchen, which is attached to a computer program that traces Tyler’s aim and movement for training purposes. Just two years ago, Tyler spent his afternoons after school in Uxbridge playing lacrosse. 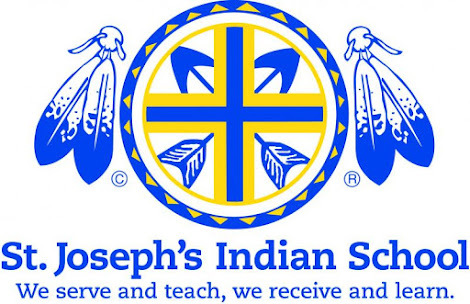 But as he realized that he was skilled at shooting, and that the sport offered both junior Olympic competition and scholarship possibilities to some of the 200 colleges and universities that the National Shooting Sports Foundation says offer shooting sports programs, he laid down his lacrosse stick. At Tyler’s level, the sport requires a significant commitment of time and energy. Members of the TMU, about 10 teenage boys and girls, not only keep up a demanding practice schedule but are required to keep a journal in which they record each time they shoot. They note their mental state, what they last ate before shooting, and the results of their session, all with the aim of improving. Kevin Winters, head coach of the junior program at the Taunton Rifle and Pistol Club that includes the TMU, advises them not to consume caffeine or sugar before they shoot. A good shot, he points out, occurs in the lull between heartbeats. Tyler, who measures just over six feet tall, learned to shoot with his brothers under the tutelage of his father, a disabled firefighter-medic. He went on to shoot a .22 at Boy Scout summer camp a few years ago. Neither of Tyler’s parents was sure that their son, who had struggled with focus difficulties for years, would be able to maintain the concentration the sport requires. Tyler has both ADHD and dyslexia; school and organizational skills, like just sitting still, were a constant challenge. But somewhere along the way, things shifted. Part of it was Tyler’s increased maturity and part of it was the focus he developed through shooting, his parents say. Tyler now stands for up to two hours during practice and competition supported by the rigid shooting suit — thigh-length jacket and pants, generally made of a stiff blend of leather and synthetic material — that is de rigueur in the sport. One thing that Tyler has learned though shooting is that identifying goals can help him make progress. So when he set his sights on the National Junior Olympics some time ago he wrote himself a note saying, “I will shoot a qualifying score for the junior olympics.” He taped the card next to the front door where he would see it every day. Tyler didn’t make it last year. But this year, he did. In April, he ranked 64th in men’s air rifle at the National Junior Olympic Shooting Championships in Colorado Springs. The handwritten card is still taped to the doorway where it has been for close to two years. His father hopes he’ll take it to college, along with his guns. Sally Jacobs can be reached at sally.jacobs@globe.com. Friends, I love finding articles like the one above because it illustrates something that the mainstream media does not want Americans to hear about -- the good aspects of youth shooting sports. And yes, this article is from the Boston Globe! As for editing of the story, the only addition to this article made by me was to add "
Northborough, Massachusetts" in the beginning so that my readers would know where this community is located. I hope you enjoyed reading this as much as I did.